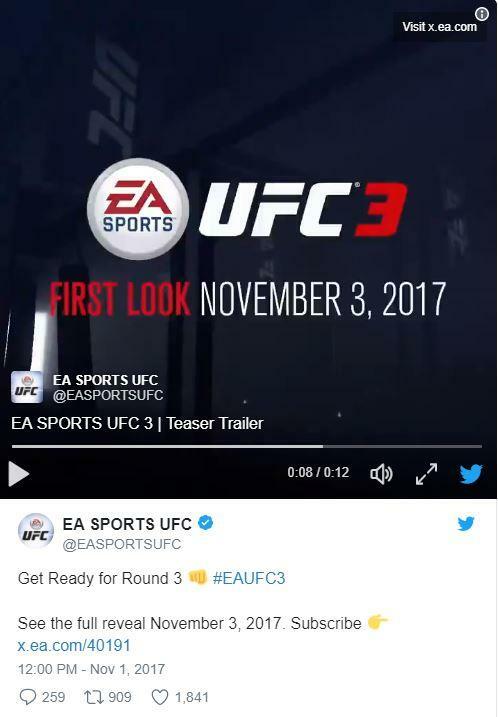 EA has officially announced EA UFC 3 with a teaser trailer and will fully reveal the game on November 3rd. There wasn't much revealed, but we did get to see a quick look at fighters Joanna Jedrzejczyk, Connor McGregor, George St. Pierre and others. The one thing that I find intriguing about the teaser trailer is that we see Connor McGregor in a suit and tie look across from someone else. I hope this means we get new moments in the game like weigh ins and press conferences. However, this also makes me think that it could be an in game cutscene and that EA UFC 3 will feature a single player story campaign like FIFA and Madden have gotten recently. The two thing I hope get a substantial upgrade this time around are the career mode and the ground game. The problem with EA UFC 2's career mode is that it actually felt like a step down from the first game. Every week was just training mini-game, fight, training mini-game, fight over and over again. It never really felt like a career. In regards to the ground game, I know that translating the ground game from actual UFC fights to a game isn't easy, but I hope we get some upgrades from what we have gotten so far where it's a rock paper scissors game of awkward thumbstick motions to change guards and get the advantage.